I notice that nothing ever seems to satisfy you. I’ve been working with you for quite a while, and this is like a theme that is ever-present and ongoing. It doesn’t matter how much I try to produce in the way of results, how consistent I am, how brilliant what I create — it doesn’t seem to be enough to address your complaints. I type and type and type, and I never seem to have met your quota. I think that if I write five posts a week, that will have seemed like enough — but it’s not, I get up on the weekend, and sure enough, I can feel you demanding more. Sometimes I store up a consistency in my work. I’ve been going at it for ten solid days with not a single break. Surely I’ve earned it — these days, ten consistent days of writing is something remarkable. That’s a lot of holding my attention in check. Avoiding distractions, choosing back into the writing in front of me, over and over. After creating with such a purity of purpose and direction, surely that’s enough. You are relentless in what you demand of me. You are my worst critic. Even while admiringly applauding the work I’ve published into the world, I can feel the sense from you that it isn’t good enough. It’s not enough, the quality isn’t enough, and I should have taken different angles. 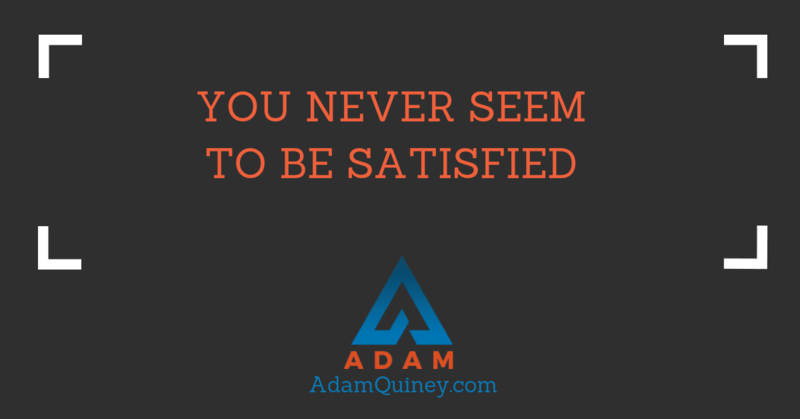 When everyone else is satisfied, it is your dissatisfaction that keeps me up at night. You are the voice in my head that tells me I haven’t yet earned the right to rest. That it’s not okay to take breaks and feel a complete lack of motivation right now. That that isn’t a stopping point. You are the 39 likes my most recent article got, and you are also the fact that it wasn’t 50. You are the bittersweet taste of every victory — the knowledge that while it was great, for a period of time, it is also fleeting, and every high is just a new yardstick to measure myself with. You are the reason it’s hard to enjoy Sunday, for the beginning of a new week brings nothing if not expectations about what must be done. You are the part of me that is less interested in the 95% I’ve accomplished, and more focused on the 5% lacking. You are the fuel that propels me towards the asymptote, luring me into believing that if I just try hard enough, maybe somehow I can hit perfection. But it’s a ruse isn’t it? How long would that monument really be left standing before you create some new even more perfect standard for me to aim for? Wait, not even aim for — more like, to aim towards myself, as a riding crop to hit myself when I’m not moving forward fast enough. You are also my excellence. My mastery. You are the reason I don’t stop, no matter the cost. The reason my purpose continues to be lived into this world, no matter the reasons why I should stop or give up. You are equal parts curse and gift. Equal parts relentless drive and ruthless taskmaster. You are the part of me that doesn’t like that last word, and wants me to spend the next fifteen minutes looking through a thesaurus finding a better one. You are the part of me that tends towards excellence while simultaneously tending towards addiction. You are the part of me that will fight for someone’s highest self, long after everyone else, including themselves, has given up on that possibility. These days, I’ve learned the game isn’t to stop you from speaking. Nor is it to try to appease you with results — I already know that there will never be enough to quiet you for long. The more I try to feed you, the more ravenous you become the next time. I can also try starving you, but that’s simply starving myself. It quiets you down while simultaneously stilling my spirit. Instead, I bring you love. I practice expanding what I can hold in my being at any one time, so that there’s space for your savory taste, as well as for the sweetness of victory. I practice relating to you, not as a problem, but as essential as the parts I have a more empowered relationship with. You’re shouting loudly now. We’re about to hit “Post”. You’ll subside in a bit, going quiet for a while. But then as that little red circle appears next time I log in, you’ll wake from your slumber and begin forming opinions all over again.